This fresh fruit pizza recipe with cream cheese makes a delicious side dish or dessert pizza. 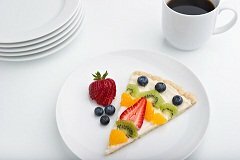 Try our recipe for fruit pizza. You will love it. A fresh fruit pizza makes an ideal brunch dish or dessert this time of year. Use any combination of your favorite fresh fruit to decorate your pizza. Tip: a pre-made cookie dough mix or ready-made dough makes this recipe a snap. It's best to refrigerate until you are ready to serve. Preheat oven to 375 degrees. Cut cookie dough in slices and line an ungreased pizza pan (14 inch), overlapping them. In a medium bowl, combine cream cheese, sugar, and vanilla extract; spread over crust. Brush glaze over fruit, making sure to cover the fruit that will turn dark.